Since the early fifties, Umicore Electro-Optic Materials has supplied germanium-based materials solutions to its markets around the world. Today we are recognized for our technical expertise, the quality of our products and our customer service. Our main markets are those of Space and Terrestrial Solar power, LED’s, infrared optics, Gamma Ray Detection and telecom applications, into which we supply germanium wafers, infrared optics, High-Purity Germanium X-tals and germanium-based chemicals such as germanium tetrachloride. Key strengths are our ability to extract germanium out of a wide range of supply feeds, including recycling flows, our materials know-how, and our focus on product performance at the level of the application. 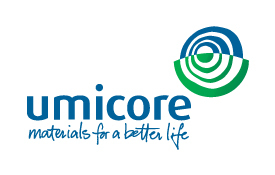 Our Electro-Optic materials unit is part of Umicore, a large Belgian based materials group with about 15.000 staff. Our Germanium Substrates and High-Purity Crystals have been part of hundreds of Space missions across the globe. The most noteworthy are the Iridium Satellite constellation with 66 satellites (1998), the international Space Station (1998- ), the Integral Space mission (2002), Mars Odyssey (2003) and the Mars Rovers Spirit and Opportunity (2004 – Now).